Provided photo The December Miami East-MVCTC FFA Members of the Month from left, Kearsten Kirby and Abigail Covault. 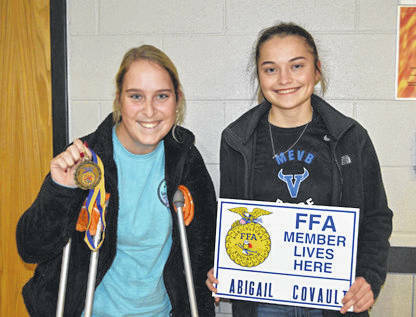 CASSTOWN — The December Miami East-MVCTC FFA Members of the Month are Abigail Covault and Kearsten Kirby. Covault is the daughter of Jim and Dawn Covault of Piqua. She is a sophomore and second-year member of the Miami East-MVCTC FFA Chapter. Kirby is the daughter of Kenny and Jenny Kirby of Piqua. She is a junior and third-year member of the Miami East-MVCTC FFA Chapter. Both Covault and Kirby participated in the recent District 5 FFA Job Interview Career Development Event. Covault was the fifth overall placing in her division (sophomore competition). Her Supervised Agricultural Education Experience Program consists of raising and breeding sows and litters of pigs each year. Kirby was the second highest fruit salesperson in the chapter’s recent fruit sales fundraiser. Her Supervised Agricultural Experience Program consists of raising and breeding goats and market goats for the fair. https://www.dailycall.com/wp-content/uploads/sites/30/2018/11/web1_KK-and-AC.jpgProvided photo The December Miami East-MVCTC FFA Members of the Month from left, Kearsten Kirby and Abigail Covault.